Leeds Nightline first started in 1973 and since then has been constantly evolving. In the past forty years we have continued to develop and expand our services to provide the best support available for students. This is achieved through the provision of our listening and information telephone line and more recently online, using ‘Instant Messaging’ (IM). Leeds Nightline supports students from all over Leeds including those studying at the University of Leeds, Leeds Beckett University, Leeds Trinity, the Northern School of Contemporary Dance and other higher education institutions. This is testament to the fantastic efforts of our Nightliners who man the phones and IM service each night of University of Leeds term-time. We are incredibly proud of each individual’s dedication to the organisation. The society is led by a committee of 19 volunteers, who are each responsible for different areas within Nightline. 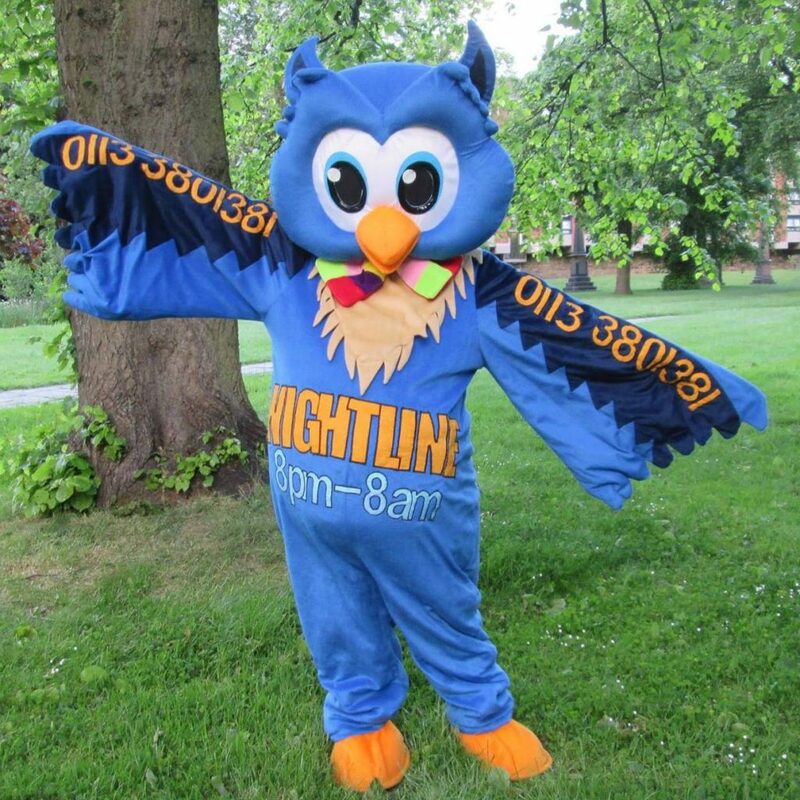 We also have a mascot – Nigel the Owl – who you’ll spot at our publicity drives! Nigel also starred in one of our promotional videos, where he visited other Leeds societies. You can watch the video on our facebook page, linked below. For any business related inquiries, or if you are at Leeds or the surrounding area and are a HE/FE institution not already affiliated with us and would like to develop more connections with Leeds Nightline, please contact [email protected]. We’d like to make Nightline callers aware that calls may be monitored or recorded for training purposes in line with the Telecommunications Regulations 2000. Caller confidentiality will still remain our number one priority.